Low cost, lightweight, and easy-to-use, pocket camcorders have been a big hit with consumers. But smartphones, like the Galaxy and Apple's iconic iPhone, have been an even bigger hit. In addition to their multiple computing functions, a growing number of smartphones can record high definition video. This begs an obvious question: if that slender smartphone in your pocket can record ​HD video, do you really need a pocket camcorder? When it comes to video quality, the newest smartphones offer 4K, or 3840 x 2160 resolution, bringing you realistic colors and higher frame rates, and is the standard that Vimeo and YouTube support. Some smartphones also have 4K screens. Most camcorders include at least a 10x optical zoom lens. Some have 3D capability, GPS receivers for adding geographical identification (known as geotagging) or built-in, or pico, projectors. Newer models also offer 4K-resolution. While this may seem a toss-up for everyday videography, pocket camcorders excel in specialized situations, especially action videos - e.g., the GoPro line of camcorders are small, lightweight and rugged, unlike your smartphone. While smartphone prices have come down and are heavily subsidized by mobile carriers, you can often pay as much as $800 or more for one. Pocket camcorders can usually be had for as little as $150 or as much as $1600 or more. Of course, with a smartphone, you pay every month for a voice and data plan, and those ain't cheap. Price, as you'll see below, is also a factor when it comes to storage capacity. Both pocket cams record to removable memory cards and/or internal memory. 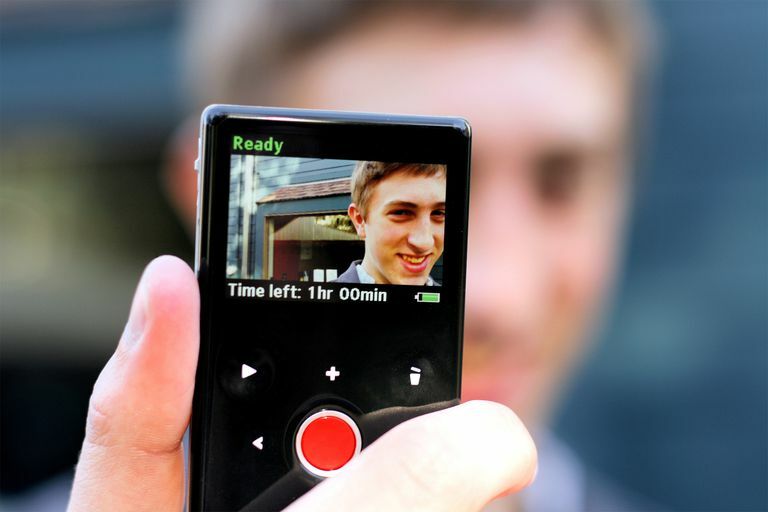 Most pocket camcorders rely on flash memory or micro-SD cards, which are removable, while most smartphones these days do not have this option. The micro-SD cards are available in large capacities and provide more than enough storage for your videos. Many camcorders will make claims of 500x or even 800x or more zoom, which is a combination of optical and digital zoom. Optical zoom is a product of the lens and works like your old 35mm SLR camera. The optical zoom is a "real zoom" where the lens actually moves in and out. You want a high optical zoom in the camcorder you are considering. Digital zoom takes the pixels, which comprise your image, and makes them larger. Your picture may look closer, but it may also look blurry or distorted. Most smartphones feature digital zoom, although we are seeing a few models with optical. There is such an array of both smartphones and pocket camcorders these days, size and weight become almost a secondary consideration, behind the application. Most pocket camcorders smaller displays. Smartphones, by contrast, can have large screens as large as 5.5-inches with multi-touch capability to boot. Also, many smartphone displays are considerably brighter and sharper than anything you'll find on a pocket camcorder. When you're done shooting your footage and you want to transfer it to a PC or Mac, pocket camcorders make it easy, with built-in USB ports and software that's pre-loaded onto the unit. Smartphones offer no such luxury. But smartphones can (in theory) upload that video on the spot via cellular or Wi-Fi networks. Uploading your smartphone video over a cellular network isn't very cost effective (or time effective) but it can be done. If you're looking for something that's "point-and-shoot", smartphones are more complicated than a pocket camcorder - which has few controls and menus to get lost in. This one's not even close: while pocket camcorders have gotten more feature-rich, they can't hold a candle to the nearly limitless things you can do on (and with) a smartphone. Even in the video department, a growing library of apps lets you add effects and tweak your videos, so even if the phone itself doesn't offer video controls out of the box, third-party software can. If you want to record video while you are on the beach, white water rafting, or trekking through a sandstorm, there are a growing number of waterproof and rugged pocket camcorders, such as the GoPro line, that can handle whatever nature dishes out. Smartphones, on the other hand, are pretty delicate creates. Pocket camcorders and smartphones match up fairly well in the feature department, but pocket camcorders retain an edge in some quality specs.